NeoStrata Skin Resurfacing Duo is ideal for a quick fix for dull skin concentrating on more resistant dry skin areas. This duo will give you quick results with no downtime. Directions: Apply Crystals. Massage gently for 1 minute. Apply Activator over Crystals. For sensitive skin, mix both products in the palm of hand before applying. Massage gently for 2 minutes. Rinse. Can be used 3-7 times weekly on face, neck, décolleté and hands. The Crystals mechanically and safely exfoliate the skin. The Activator allows the release of powerful anti-aging benefits. I love love love this product!! I notice results after one use, and can tell when I run out. It makes my skin smooth, soft, and glow! I like to follow it with a hydrating mask or oil, right before bed. My skin glows. Love it! I use it about once a week or so, then hydrate with a good facial oil. Highly recommend. It may seem like a dramatic review, but how can I give a product more than one star if it didn't do any of the claims listed for the product? It only left my face feeling soft for less than 24 hours. Had much more success with BHA and AHA's. Don't waste your money. Any mechanical exfoliation will give you the same result. These products are fantastic! Even after the first use I noticed a difference in the look and feel of my skin. I am 53 years old these are a great choice for me! Best exfoliant I've used. Very fine crystals gives a very smooth texture when finished without leaving redness or irritating the skin. I am 59 and just tried this product. Unbelievable! Deep lines are no longer as deep and it did not irritate my skin. I love how it makes my skin feel afterwards. I don't know whether I would use it every day, maybe 1-2 times per week. Wonderful product, been using for years. Not too harsh, crystals are amazing and fine - but effective. I use this after the peel to help minimize my acne scaring. Amazing stuff! I received a sample from Shopper's and LOVE this product. My skin was so dull looking after having had a second child. The results were immediate with brighter and smoother skin. I like this product. interesting how skin gets fresh, radiant look and I also feel better. Mini massage of face 2 to3 times a week. I really like neo strata products. This one makes my skin feel great- clean ,fresh & very soft .i would definitely recommend . This product is fantastic. Been using if for about 3 years now once or twice a week. It only takes three minutes and the results are great. I have been using this for years, and it makes a big difference in my skin's texture and clarity. It is not cheap, but one box will last for several months. Worth every penny. Love this product. The texture of the exfoliant was exactly what I was looking for. Many of the 'scrubs' out there are either too pasty without enough grit, or too viscous. I was looking for a product that would afford me spa-like results with a fresh feel and this is exactly what I found. Best bang for your buck!! I like this product. It makes the skin look good & very fresh. Fabulous! This product makes my skin so smooth and eliminates the fine lines after one application. I highly recommend it. Love this product. You skin feels so refreshed and smooth after use and for a couple days following. I landscape by trade and am out in the 'elements' all day. I have used Neostrata products for years and find them mostly all effective. Plus the pricing I feel is reasonable a bit more than some over the counter cosmetics, but far below some of the other 'boutique' lines. 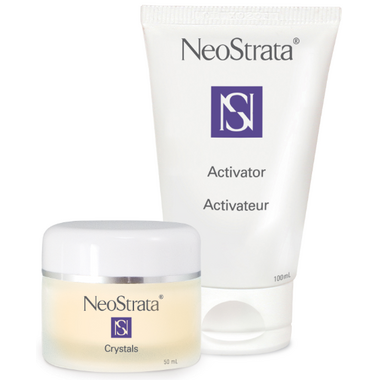 Plus, Neostrata always has great bonus buying incemtives - free gifts etc. Highly recommend the line to everyone. My skin was so soft after using this. When I was rinsing it off I really could not believe how soft my skin was. My pores were less noticable and my skin was much more radiant. Between this and Neostrata's peel, I can't decide which is my favorite product.. Definately 5 Stars!! This product is awesome- I can't believe how soft it makes my skin. My skin just glows for a couple of days after I use it! I was skeptical when I bought it but I love this product!